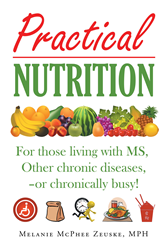 Recent release “Practical Nutrition” from Page Publishing author Melanie McPhee Zeuske, MPH, prolifically expounds the importance of nutrition when managing a chronic disease or a busy lifestyle. Acknowledging the realities of life is vital to making permanent changes in food choices. Melanie McPhee Zeuske, MPH, a former public health dietitian and mother who currently focuses her nutrition education, supervising skills, and available energy on her family despite having multiple sclerosis, has completed her new book “Practical Nutrition”: a profound narrative that delves into the essence of living a healthy lifestyle within the unpredictability of a busy schedule or a chronic disease. Author Zeuske stresses the significance of finding the meal planning, shopping, and preparing strategies that fit the reader’s customized life which is as unique as each person. “Living with MS, another chronic disease or a hectic schedule is challenging. Staying healthy while managing the symptoms in addition to the rest of what life serves up is important to having a high quality of life. An important part of good health is eating well. Accomplishing this can be overwhelming at first, but when brought about in a practical way, it can be very satisfying.” Throughout this interactive book, many ideas and suggestions are presented, and questions are posed in each chapter to bridge goals into practical action steps. Published by New York City-based Page Publishing, Melanie McPhee Zeuske, MPH’s abounding narrative speaks from the author’s expertise in dietetics/nutrition and experience of living with multiple sclerosis (MS). By addressing these practical aspects of life, eating becomes more intentional and preparation can be streamlined to conserve energy thereby healthier foods are readily available even during busy, high stress and low energy times. Practical Nutrition emphasizes taking control of nutrition in a practical and meaningful way to improve the quality of life in a monumental way. Readers who wish to experience this informative work can purchase “Practical Nutrition” at bookstores everywhere, or online at the Apple iTunes store, Amazon, Google Play, Kobo, or Barnes and Noble.